Citizens United unleashed a wave of special interest spending that threatens to drown out the voices of middle class families. 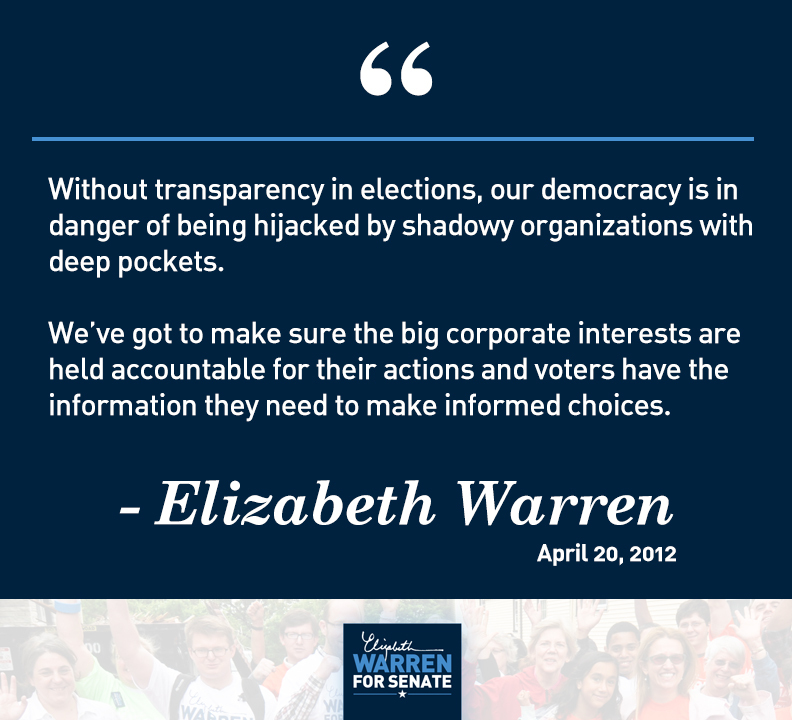 Billionaires and big corporations can spend unlimited amounts of money during campaigns while they hide behind a curtain of secrecy. The DISCLOSE Act will provide accountability, requiring that those who fund political advertising make their support public. It requires outside organizations that spend more than $10,000 to report that spending to the Federal Election Commission within 24 hours and to disclose donors who give more than $10,000. In 2010, this common sense legislation had majority support, but Scott Brown cast the deciding vote to kill it. It’s time for Scott Brown and the Republicans to stop protecting their influential friends by helping them hide their influence from the public.